What an amazing day! Kate will make a great addition to the royal family and she looked beautiful. I loved the dress! Today was a day where I felt immensely proud to be British and proud that we have a great history of tradition which I am now able to pass on to my children – The pomp, ceremony and national anthem made me happy to be able to wave the British flag in front of the tv. My daughter (who is princess obsessed) said that the wedding was the best princess film she had ever seen and to see her learning proudly about what it means to be British bought a tear to my eye! 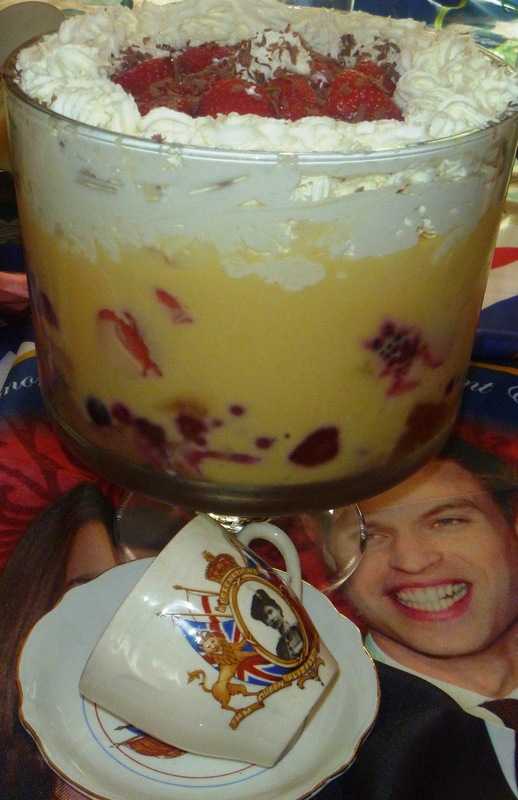 I decided the make a traditional British trifle to celebrate the union of the happy couple. Relishing the chance to use my pampered chef glass trifle bowl, my portions were quite big to fill the bowl. I did cheat slightly and used ready-made trifle sponges and custard, as I wanted to enjoy the wedding rather than spending hours in the kitchen. After watching the coverage all morning, we headed off to my friend Sharon’s royal wedding party where we had a fantastic time and my trifle went down a treat. 4) Repeats Steps one to three with the remaining sponges, fruit and wine. 5) Allow the wine to soak into the trifle sponge for 10 minutes. 6) Pour the custard over the top of the fruit and smooth over. 14) Cover and refrigerate or serve immediately.